In this spring lakes of Finland got rid of the ice cover earlier than average. During last few days summer has gone on and white blossom of apple trees has been glorious. With the help of warm and sunny days water temperature has risen quickly also on bigger lakes. Predator fish has started to eat more and more. Pike spawned few weeks ago and now they are really hungry and feasting on all fish species they can get. Anglers may still find pike from shallow waters near spawning areas. Waters get warmer fast and fish dive little bit deeper. Rocky shores and shoals are good spots now. 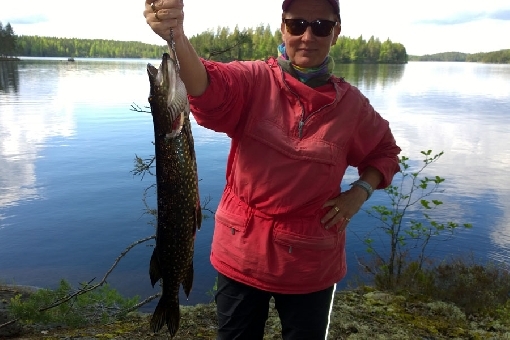 On lakes where there are lot of vendace – a small salmonoid – pike can also be found from the bottom or from the midwaters near the deeper areas by trolling with deep diving wobblers and spoons.